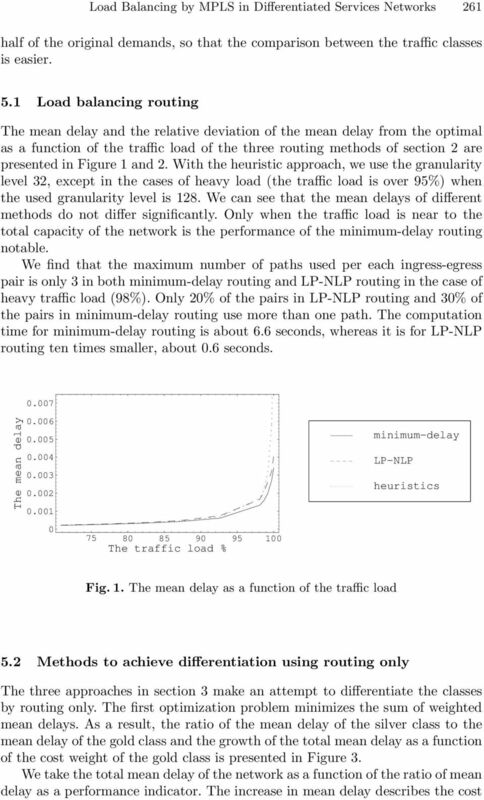 Download "Load Balancing by MPLS in Differentiated Services Networks"
14 266 R. Susitaival, J. Virtamo, S. Aalto optimization seems to have the smallest mean delay. 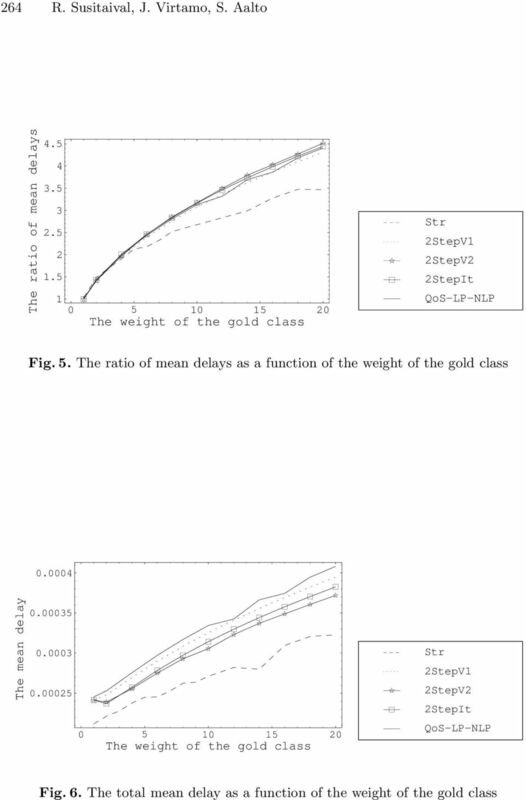 The difference to other algorithms is significant when the ratio of mean delays is small. 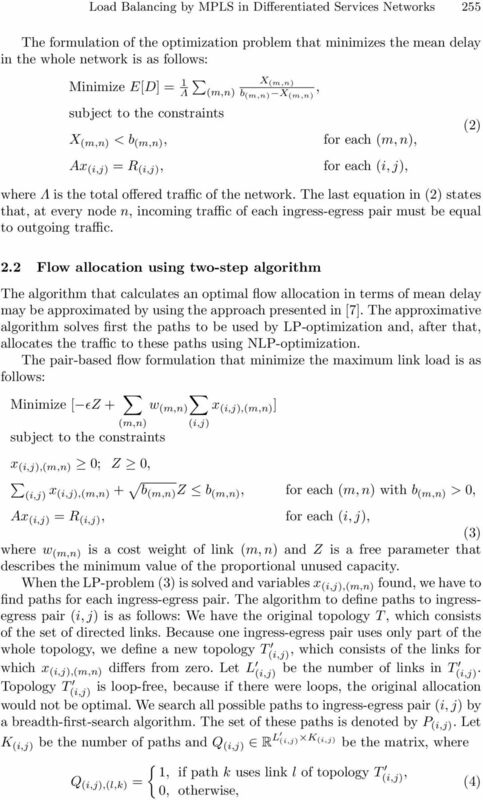 When the ratio is greater, the performance of the two-step algorithm that utilizes both routing and WFQ-weights ( 2StepV2 ) is near to optimal. As a conclusion, the differentiation methods that make use of both routing and WFQ-scheduling ( Str, 2StepV2, 2StepIt, FLDW ) perform better than the differentiation methods that make use of only WFQ-scheduling ( 2StepV1, QoS-LP-NLP and FLD ). 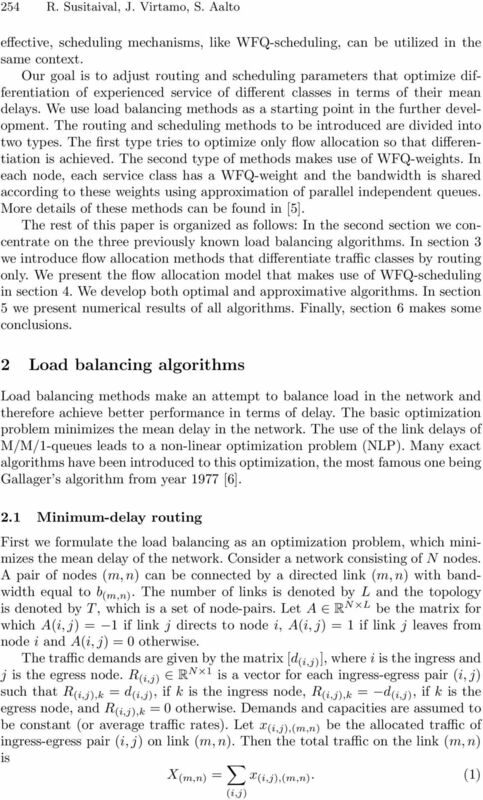 6 Conclusions We have used load balancing algorithms as a starting point when developing methods that try to differentiate traffic classes in terms of the mean delay. 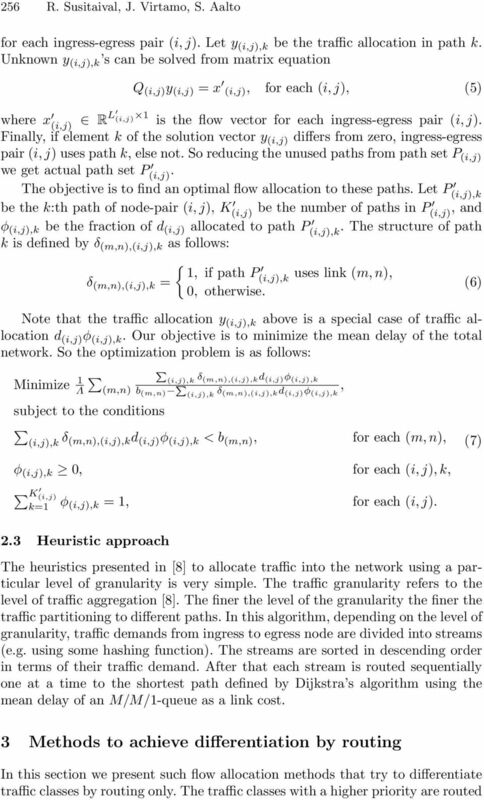 In the first model differentiation is achieved by using routing only. 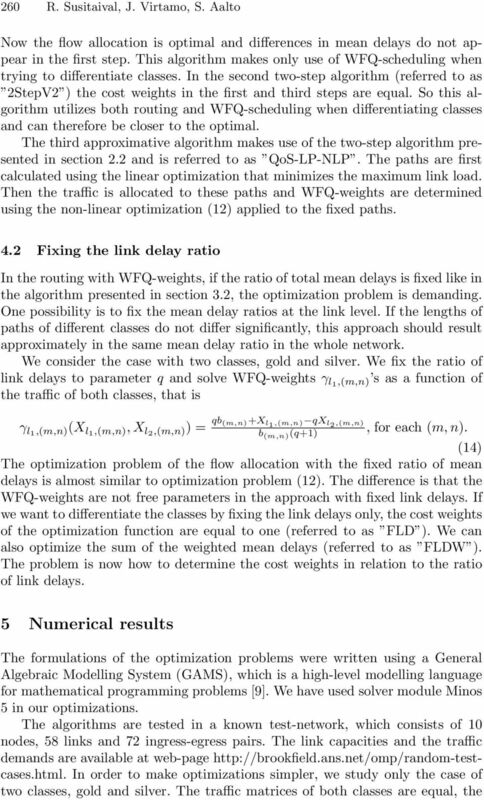 The mean delay using the algorithm that uses cost weights and the algorithm that fixes the ratio of mean delays are equal. The advantage of the latter algorithm is that the cost weights need not be known in advance. The mean delay using the heuristic approach is a little greater than using the other two algorithms. 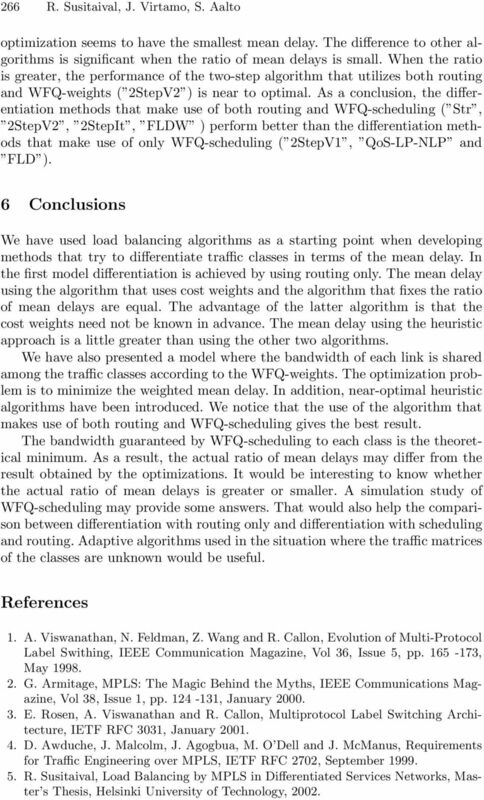 We have also presented a model where the bandwidth of each link is shared among the traffic classes according to the WFQ-weights. 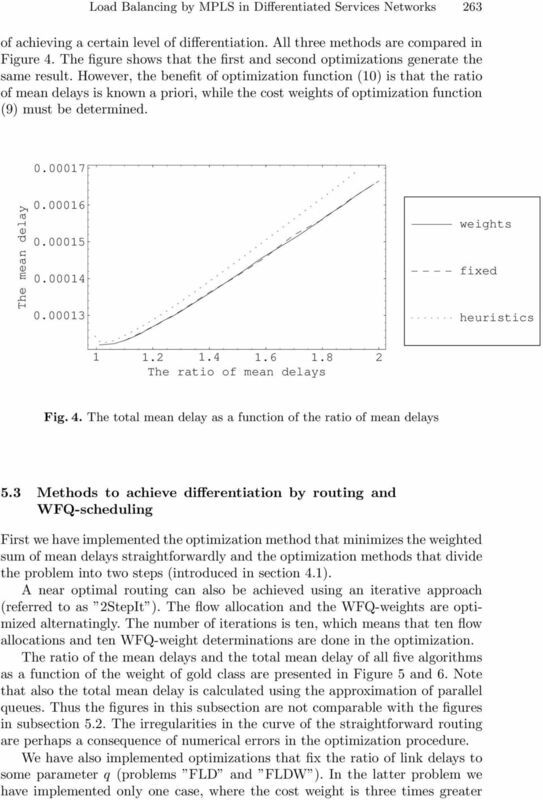 The optimization problem is to minimize the weighted mean delay. In addition, near-optimal heuristic algorithms have been introduced. 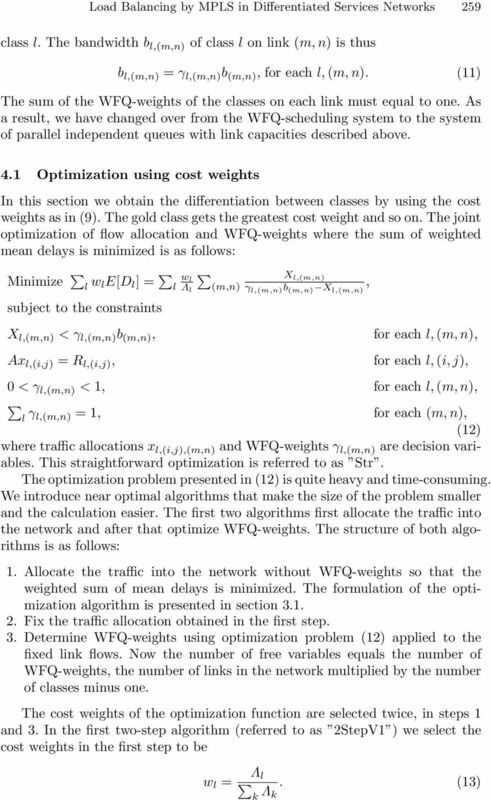 We notice that the use of the algorithm that makes use of both routing and WFQ-scheduling gives the best result. 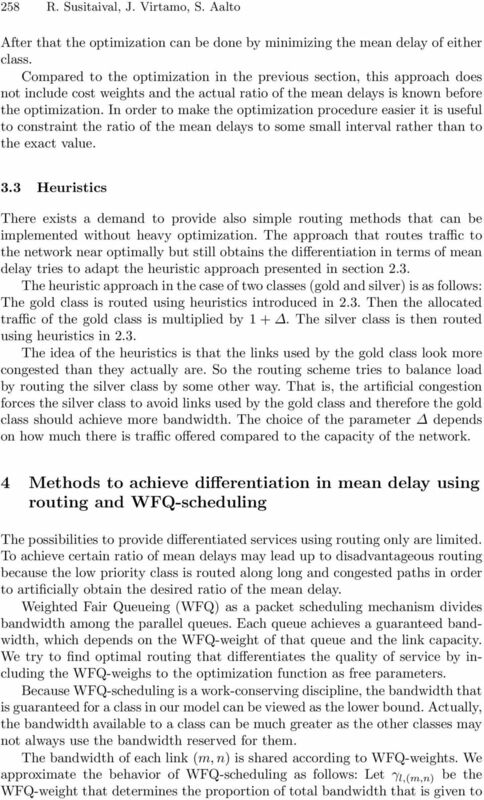 The bandwidth guaranteed by WFQ-scheduling to each class is the theoretical minimum. 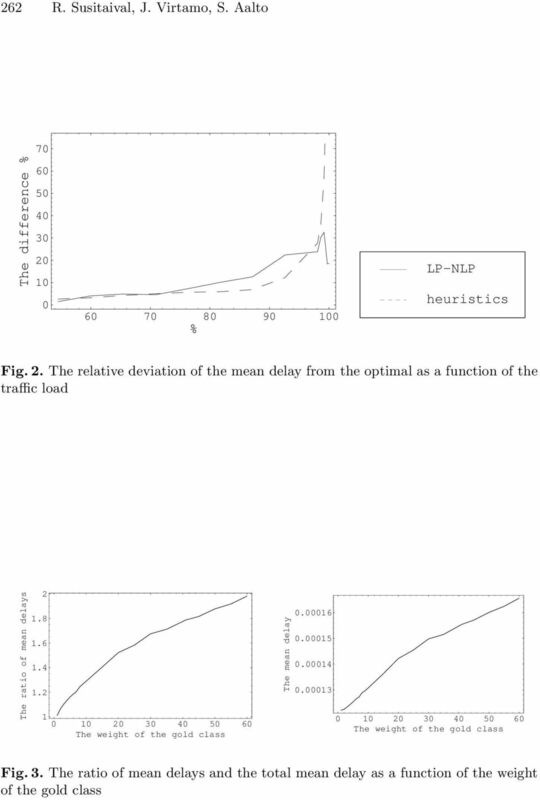 As a result, the actual ratio of mean delays may differ from the result obtained by the optimizations. 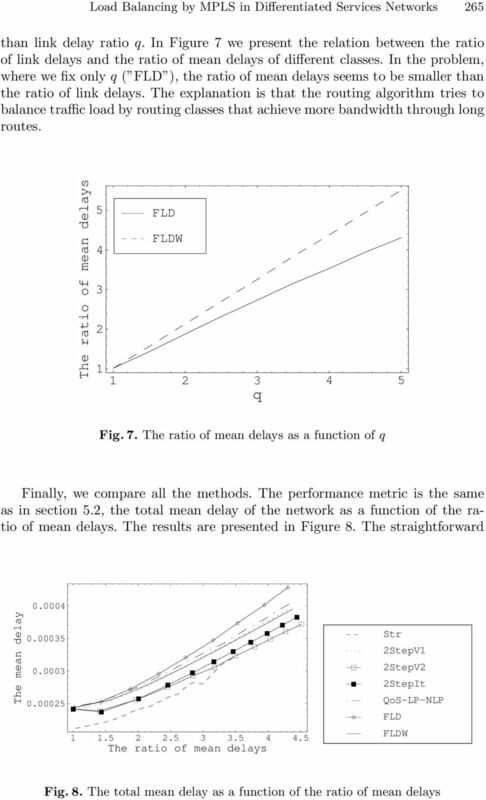 It would be interesting to know whether the actual ratio of mean delays is greater or smaller. A simulation study of WFQ-scheduling may provide some answers. That would also help the comparison between differentiation with routing only and differentiation with scheduling and routing. 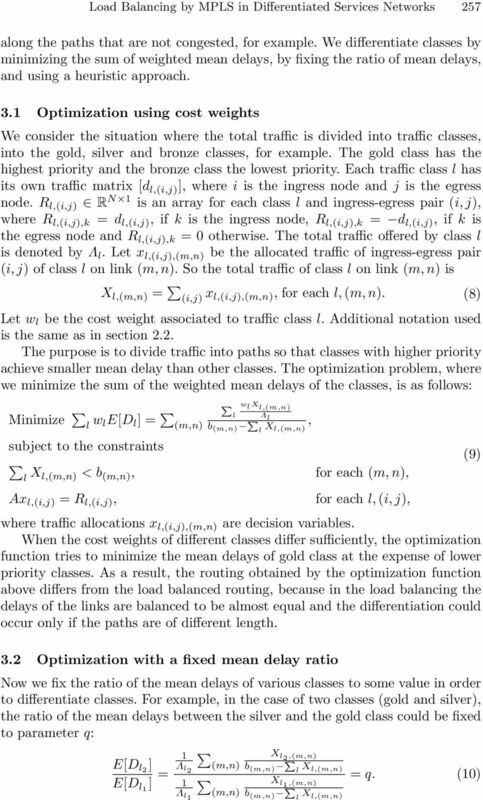 Adaptive algorithms used in the situation where the traffic matrices of the classes are unknown would be useful. References 1. 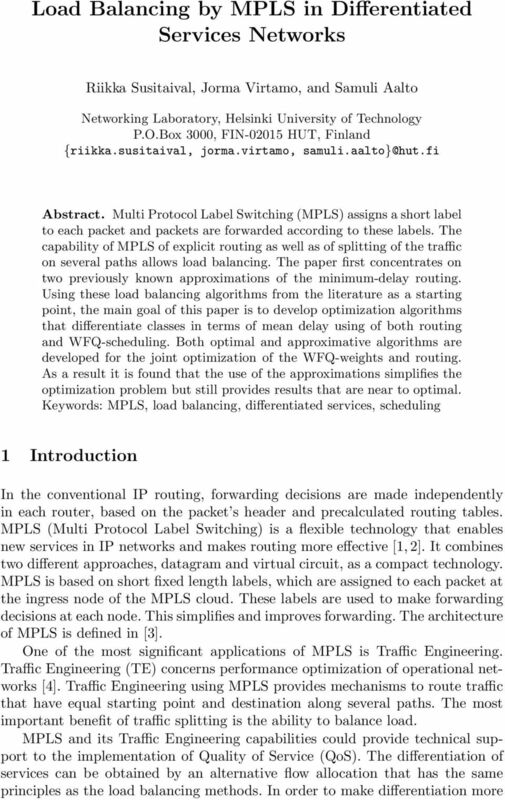 A. Viswanathan, N. Feldman, Z. Wang and R. Callon, Evolution of Multi-Protocol Label Swithing, IEEE Communication Magazine, Vol 36, Issue 5, pp , May G. Armitage, MPLS: The Magic Behind the Myths, IEEE Communications Magazine, Vol 38, Issue 1, pp , January E. Rosen, A. Viswanathan and R. Callon, Multiprotocol Label Switching Architecture, IETF RFC 3031, January D. Awduche, J. Malcolm, J. Agogbua, M. O Dell and J. McManus, Requirements for Traffic Engineering over MPLS, IETF RFC 2702, September R. Susitaival, Load Balancing by MPLS in Differentiated Services Networks, Master s Thesis, Helsinki University of Technology, 2002.